The latest version of android ICE CREAM SANDWICH combines the best features of honeycomb and gingerbread into one platform. If you’ve fallen in love with the sliding widget, new task launcher and the awesome interface then worry not because they will be available in Android 4.0 along with many other new features. Ice cream sandwich improves the multi-tasking that was already available in android taking it to a whole new different level by introducing multi-tasking menu that is present on honeycomb. This new multi-tasking menu will enable the user to control the running apps in the Android just like you would control what is running on windows desktop. Memory optimization is also improved making sure that the running application uses only a set of predetermined memory and when it is closed that memory is made free for other program to use. It will also enhance your application usage. Along with a new interface which relies on sweep gestures to close the running application. Even the app image is displayed in the task manager which makes it a joy to use. Home screen is now more streamlined allowing you to re-size any widget and put them anywhere in the home screen. Another new feature is the ability to create folders right in home screen which can be customized very quickly and efficiently. Android 4.0 Ice Cream Sandwich offers better and improved integration of Google+ and now you can do teleconferencing with up to 10 people simultaneously with a feature of Google+ known as hangout. Many of us have heard about NFC support in new devices but there was no possible way before to create that integration directly into the operating system without the use of an external application. 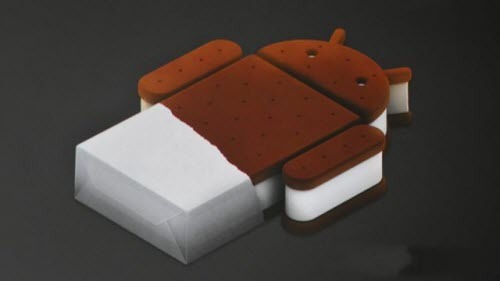 Ice cream sandwich changes that by using a new feature called ANDROID BEAM which provides native NFC capabilities and along with NDEF Push Technology it will allow you to exchange data and information between two android devices with NFC capabilities. So just on the TAP of a button NFC can be activates and contact, webpage, video, music can be transferred between phones just like Bluetooth but at a reduced power usage and high speed. A new feature of Ice Cream Sandwich that wasn’t available on honeycomb and neither on ginger bread is FACE UNLOCK which will allow you to unlock your device using your face rather than setting up a password which you might forget. The entire Ice Cream Sandwich OS has received a facelift with darker blue theme and a new font that imparts an presence that will make you want one. The most important reason that Google developed Android 4.0 was for the aim of one OS to rule both the tablets and phones.